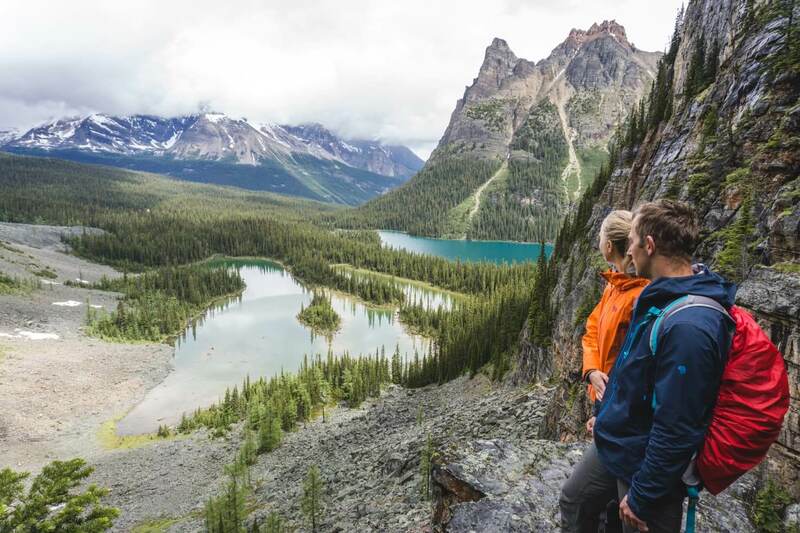 Lake O’Hara and a surrounding area featuring hiking trails and crystal clear lakes are truly unique alpine experience in Yoho National Park. It is away from the crowds and offers much-needed solitude that people seek in nature. 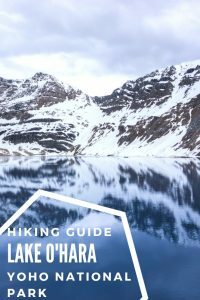 If you want to visit, you need to plan in advance and that’s why we compiled everything you need to know about hiking & camping at Lake O’Hara in this guide. 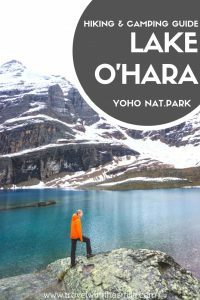 The Canadian Rockies have a few hidden gems and Lake O’Hara is one of them. Prepare yourself for endless mountain peaks, hiking trails and alpine lakes in different shades of blue where you might be all by yourself! We haven’t met many people while we were hiking in the area. Well, the only catch is actually booking a bus in time to take you there. It’s true that the best places are hard to get to. Lake O’Hara is located in Yoho National Park, British Columbia. It takes around 2 hours from Calgary and 45 minutes from Banff to reach the main parking lot. Unfortunately, due to lack of public transport, there is no other way to get to the parking lot other than by your car. You will park at the Lake O’Hara parking lot. From there, the shuttle bus takes all the campers and hikers to Lake O’Hara. In both cases, you need to book the shuttle bus which operates from June 19 to October 4, 2019. 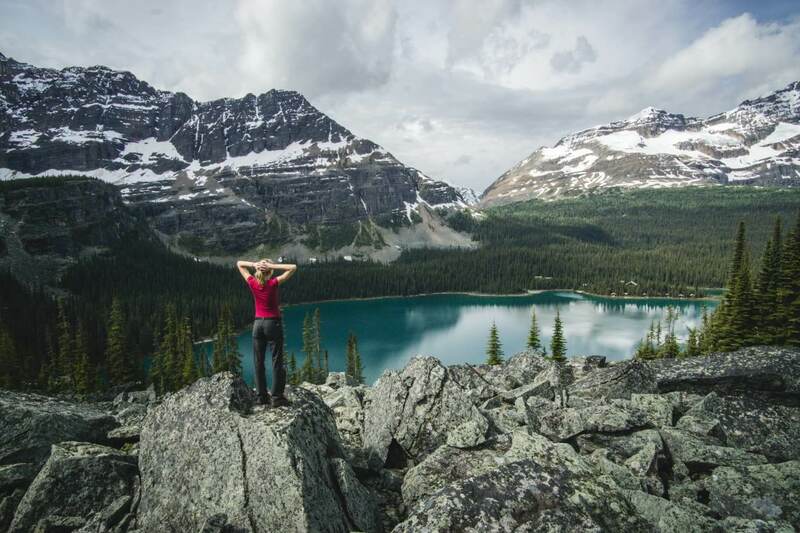 There is only one road leading to Lake O’Hara which is inaccessible to cars or bicycles. To visit, you need to book the shuttle bus, operating by Parks Canada, months in advance as there’s a limit to how many people are allowed to ride each day. 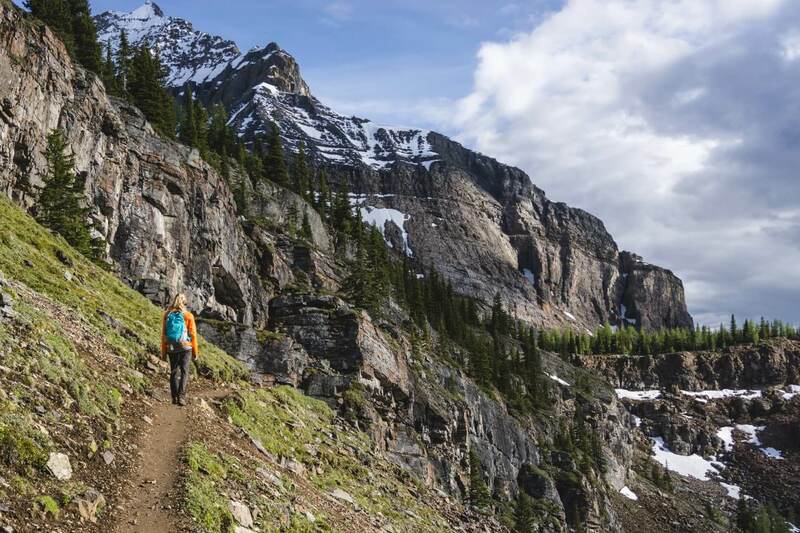 There is no limit to visit by walking the gravel road leading to Lake O’Hara, 11km one way. If there’s room, the shuttle bus can drive you back (bring CAD 10 in cash). Reservations can be only made three months ahead to the exact day of your trip. So when you call April 1st, you can only book the campsite for the date 3 months in, you can’t book for September for example. You need to call exactly at 8 am and you still might get the busy tone. Keep trying until about 10 am, it will be fully booked by then for 3 months in advance. It is important to choose which ingoing bus you would like to take before you call to make a reservation. 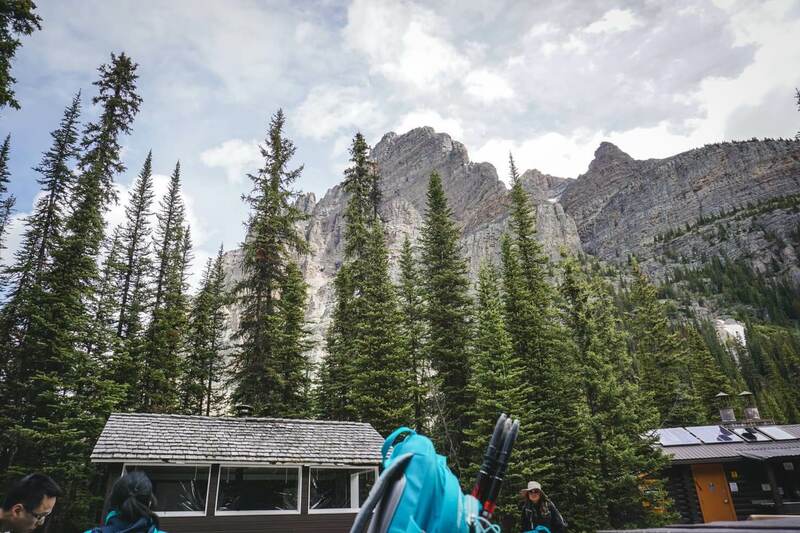 The campground at Lake O’Hara has 30 platforms with 1 tent per platform (2,7 x 2,7m) allowed. When you get off the bus, you can choose whichever platform you like. There is a very limited mountain view from the common area and the campground is in the forest. Covered by the trees at night, it means you’ll be warmer in your tent. But don’t be fooled, it can get very cold at night – we were camping at the end of June and it was snowing a bit at night so we woke up to a frosty tent in the morning. The mountains were snowy but luckily the lakes were thawed already dressed in their gorgeous blue colours. The ranger will explain the rules of the campground – you will be asked to lock all your food in the bear-proof lockers (bring your own lock). You can’t leave any food on the picnic tables or in your tent. This is to protect the wildlife so they won’t come to your tent looking for food. 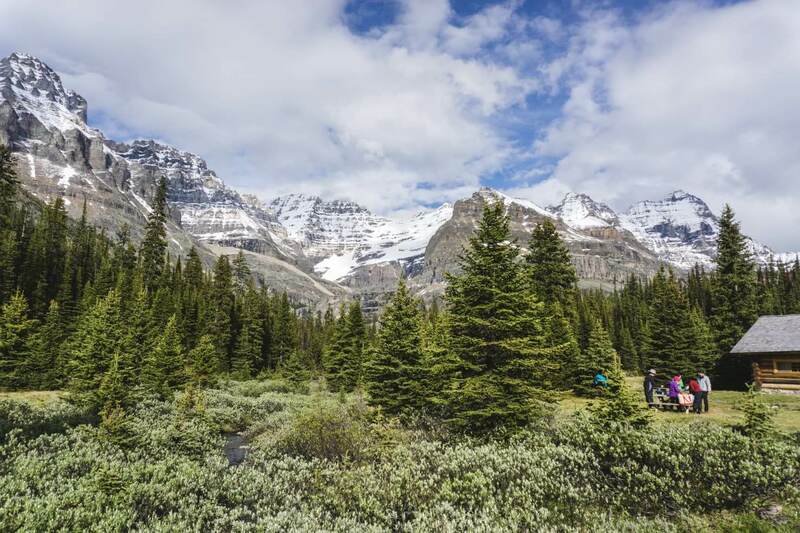 Elizabeth Parker Hut is open for visitors all year round and it’s located on a meadow about 500m from Lake O’Hara. In summer, you have to take the shuttle bus and in winter, you can go cross country skiing on the 11km long road. Due to extreme popularity, the bookings are done through a lottery system. Application deadline for summer bookings is in November the year prior (talk about hard to get). The lottery entry fee is CAD 10. If you’re incredibly lucky to score the booking, it costs CAD 35 for Alpine Club of Canada members and CAD 45 for non-members during summer. More info about the hut is here. 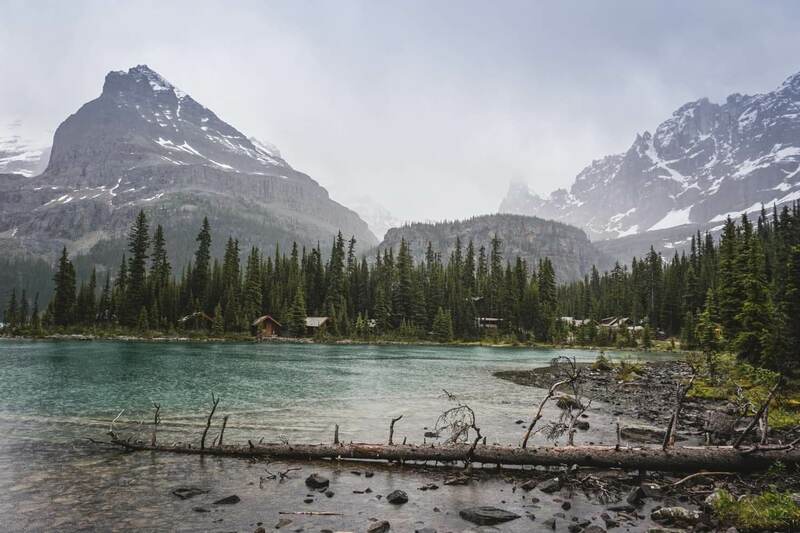 A luxurious option to stay at Lake O’Hara is a lodge by the lake or their lakeshore cabins. The rooms in the lodge start at CAD 535 per person and CAD 1,035 for cabin/2 people (minimum two nights stay required). All the meals are included and also their private shuttle bus. Click here for more info about the lodge. 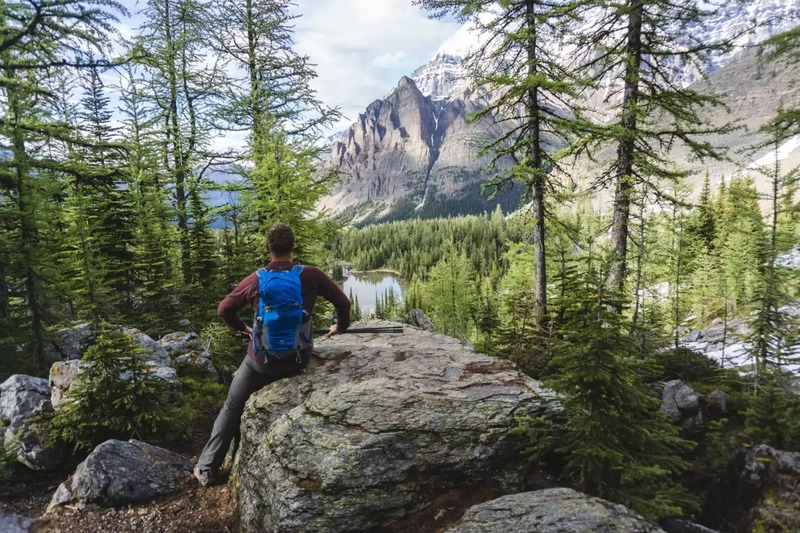 Thanks to the strict limits of people who can visit the area, Lake O’Hara is a quiet paradise that nature lovers search for. There is an extensive trail system and plenty of day hikes to choose from so you will meet very few people while hiking. If you’re not afraid of heights, make sure to hike to the cliffs above the lake, the view will take your breath away. There is a small day shelter called Le Relais where the bus drops you off that acts as a small visitor’s center. You can ask about trail conditions, purchase trail maps or buy beverages and snacks (only cash is accepted). It is open daily when the shuttle bus operates from 8:30 am to 6:30 pm. Although I personally haven’t tried it, people swear by the carrot cake at Le Relais Day Shelter. 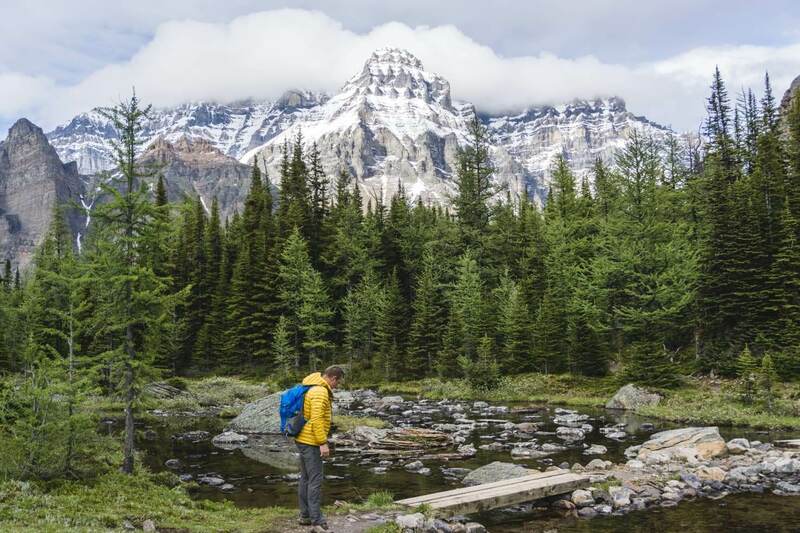 Only a few minutes from the campground is Lake O’Hara. The highlight of this short hike is Seven Veils Falls. You can also rent a canoe at the shoreline and go for an easy paddle around the lake. The trail begins at the east end of the Lake O’Hara Shoreline Trail. It starts with a few switchbacks going uphill to the top of the cliff. After you pass the cliff, the trail continues through a forest and up the steep steps. Soon you will see small pools of Oesa Creek until you reach Lake Oesa. Start at the day shelter and continue west. You will walk through the meadow and pass the Elizabeth Parker Hut. The trail ascends for the next 1km or so. Once you pass the creek, continue straight through the meadow. When you reach the McArthur Pass, continue west all the way to the shore of the Lake McArthur. Michal and I both agree that this is the most beautiful lake in Yoho National Park. The dark blue colour of the 85-meters deep Lake McArthur and snow-covered mountains in the background create a gorgeous contrast. 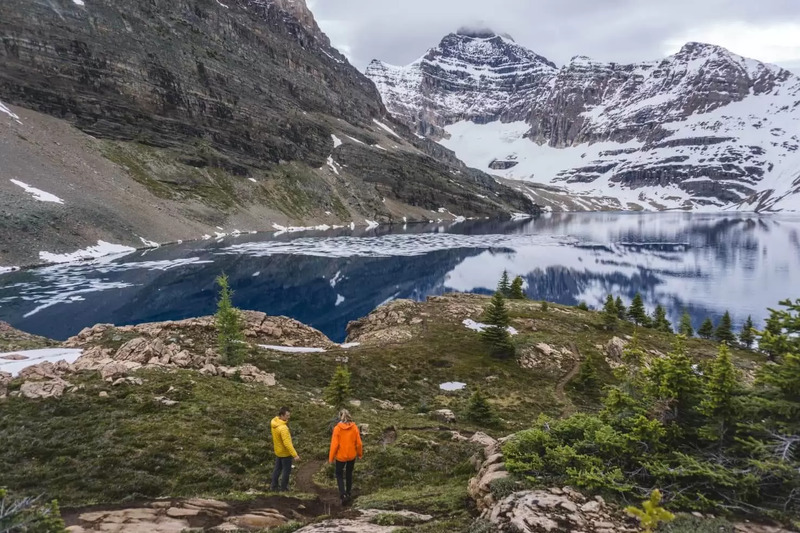 If you only visit the Lake O’Hara area for a day, this is the best hike you can do. This is probably the most popular hike in the area. 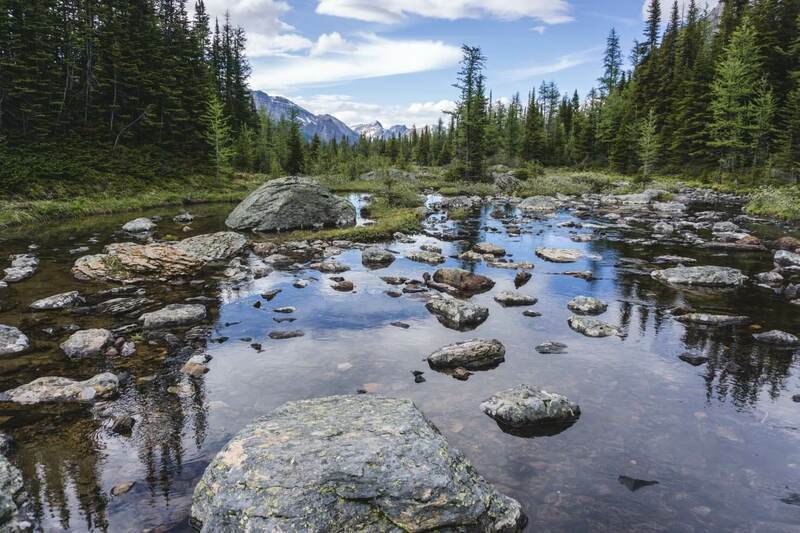 You will hike to the cliff above several alpine lakes and have endless views of the valley. 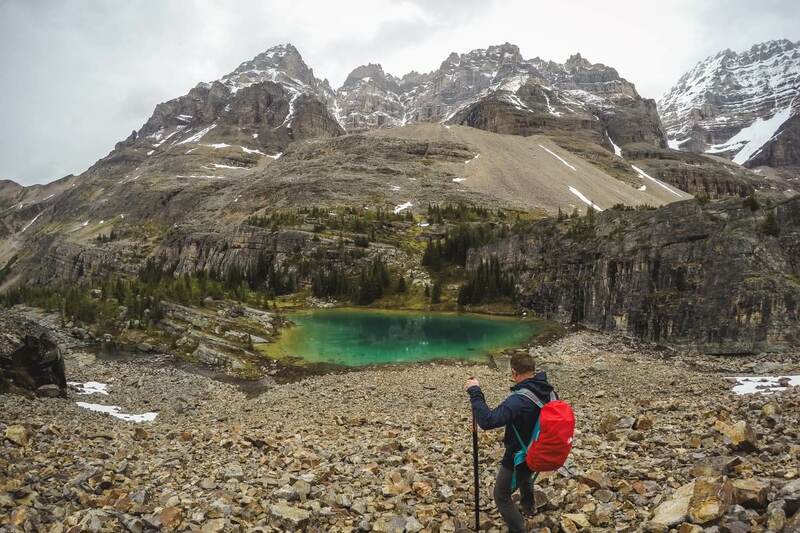 Even though it’s a circuit hike, when we’ve visited Lake O’Hara, there was still a lot of snow on the rocky and exposed trail so we did the out-n-back hike. 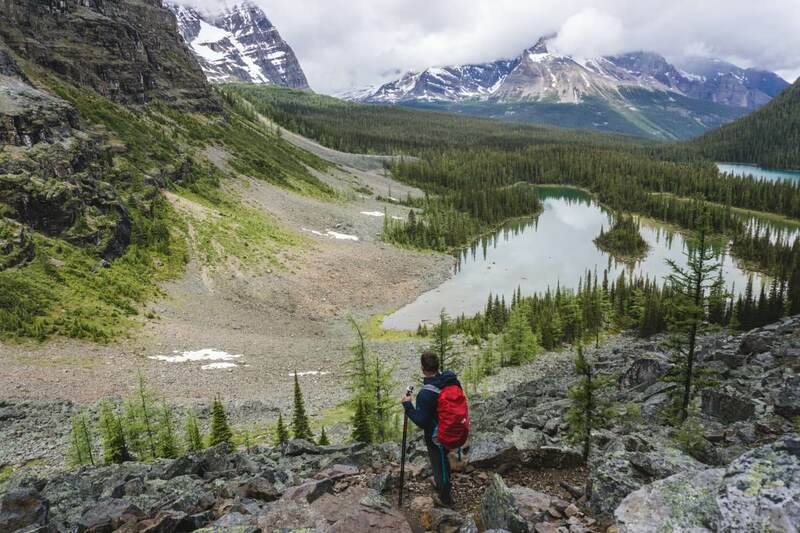 Circuit hike – the start of the trail is marked on the southwest end of Lake O’Hara. You will climb up to Mary Lake along the shoreline and then steep up the rocks to Opabin Plateau. 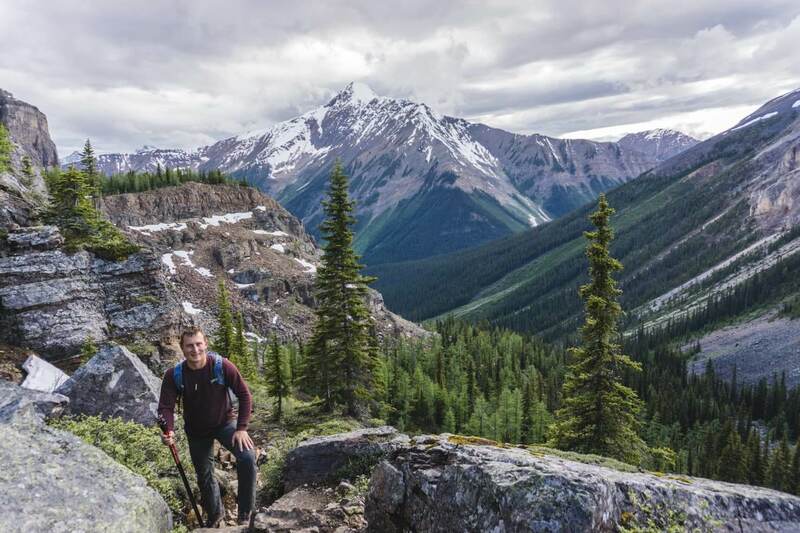 The trail continues to the cliff called Opabin Prospect – the famous viewpoint of Lake O’Hara. You will be walking on the ledges carved into the rock wall of the mountain. Even though the drop is significant, I didn’t find this hike dangerous. Start as for the Lake Oesa hike, the trail passes this lake. There is a sign at Lake Oesa towards Yukness Ledges. The views from above are on another level, incomparable to hiking around the lakes. 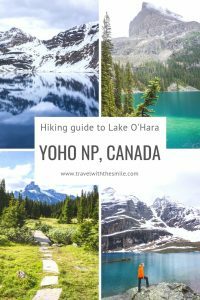 For more Yoho National Park hikes, read our hiking guide here. bug spray – especially if you’re visiting in the early summer. I’ve made my own repellent and tested it for the first time at Lake O’Hara. I’m happy to report it works perfectly and smells even better. The recipe is really simple: combine 200 ml witch hazel, 5 drops of lemon essential oil, 5 drops of eucalyptus essential oil and pour it into a spray bottle. Shake well before each use and spray on your skin or clothes a few times a day. Lifestraw bottles with filters – even though potable water is provided at the campground, we were using Lifestraw bottles and drank from anywhere. They are 650ml/22oz so you don’t have to carry big bottles on your hikes and can easily fill up from any stream or lake.